It is no secret plenty of teenagers would love a new smile. Most teens are self-conscious and awkward. These youngsters should not have to deal with an unsightly smile in addition to acne, peer pressure and the other tribulations of high school. If your teen is looking for a new smile, the solution is a smile makeover performed by an experienced cosmetic dentist. The quest for a new smile starts with self-improvement. There is a good chance your teen is not cleaning his or her teeth properly. Perhaps he or she refuses to wear a sports mouthguard when participating in athletics. Maybe your teen grinds his or her teeth while sleeping and stubbornly refuses to wear a protective nighttime mouthguard. Even your teen's diet has the potential to sabotage his or her smile. Encourage your teen to use the appropriate protective dental devices. Help him or her transition away from sugary and acidic foods/beverages toward healthier items. These seemingly minor efforts really can help beautify a flawed smile. There is no shame in using Invisalign aligners or traditional braces to straighten out crooked or improperly spaced teeth. Orthodontic devices can even be used to remedy an improperly aligned jaw. Do not let your teen continue to live with crooked, crowded or improperly spaced teeth. These problems will only worsen unless someone takes corrective action as soon as possible. Teeth that do not fit together with one another will prove that much more difficult to clean. Dental veneers are small casings bonded to the visible portion of the patient's teeth. This is a popular and versatile cosmetic treatment that really can make an ugly smile look absolutely perfect. Veneers can be placed on uneven, discolored, worn, broken or improperly spaced teeth. 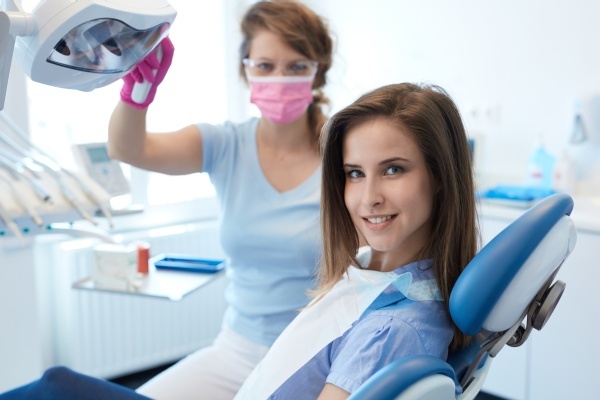 Our dentist will go to great lengths to ensure the veneers are placed just right on your teen's mouth as we are well aware of the fact that he or she is still developing. There is a common misconception that mouthguards are only worn by professional athletes and adults who have whittled their teeth away with excessive grinding throughout the years. Anyone who plays sports should wear a protective mouthguard, regardless of their age. Furthermore, people of all ages who grind their teeth should wear a protective mouthguard while sleeping at night. If you are a teen or a parent of a teen with bruxism (teeth grinding), it is time to use a mouthguard for protection against damage that has the potential to compromise the smile aesthetic. Teeth whitening is available for teens who have reached 14-15 years of age. Teeth whitening is often necessary at such a young age as many of today's teens have consumed copious amounts of soda, tea, coffee and energy drinks during adolescence. After whitening these stained teeth, your teen will have the confidence necessary to smile in those all-important social settings at school, parties and other get-togethers. Request a smile makeover consultation for your teen here: https://dentistmiamibeachfl.com or call Miami Beach Smiles at (305) 203-4148 for an appointment in our Miami Beach dental office.